The 75th anniversary of Operation Market Garden. Will feature a 'special' program. On the ground WWII camps will be set up and vehicles will drive from Belgium to the Netherlands following the route taken in 1944. 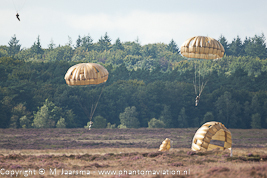 Around 1.500 paratroopers will jump at several locations including Groesbeek near Nijmegen. Poland will be present in Driel where their forces landed to support their British colleagues. 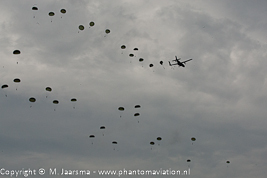 Jumps at the Ginkelse heide will take place at 13.10 the same time the first paratroopers jumped in 1944. 70th anniversary of operation Market Garden. In the week prior to the commemoration jumps more events were held. The US Army send UH-60A Black Hawk helicopters who together with soldiers from the 82nd Airborne Division gave a demonstration of an assault on the Bridge at Grave. 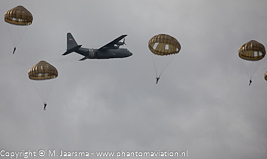 Until 2008 the transport aircraft operated from Soesterberg Air Base. The base closed at the end of 2008. From 2009 Eindhoven Air Base is hosting the aircraft. In the past Deelen Air Base (currently military aviation terrain Deelen) was used to support the transport aircraft. Deelen AB closed as an active air base in 1995. USAF C-130H wearing D-Day markings over the drop zone. Photo Market Garden 2015 (due to the weather no 2017 photo available). A Transall over the Ginkelse heide landing zone. 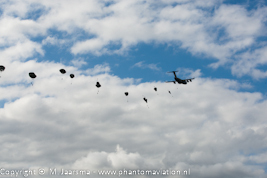 The debut of a C-17A during Market Garden commemoration jumps. 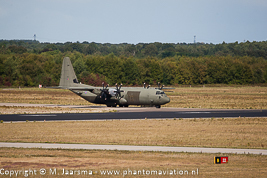 RAF Hercules C.4 about to depart from Eindhoven in 2012. 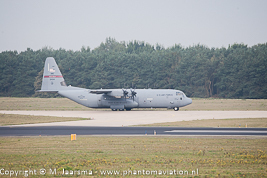 C-130J-30 from 143 AS / 143 AW Rhode Island ANG at Eindhoven in 2013.